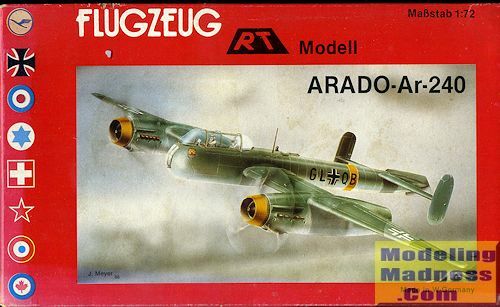 The Arado Ar 240 was a German twin-engine multi-role heavy fighter aircraft developed for the Luftwaffe during World War II by Arado Flugzeugwerke. Its first flight was in 1940, but problems with the design hampered development and it remained only marginally stable throughout the prototype phase. The project was eventually cancelled, with the existing airframes used for a variety of test purposes. Technical specifications were first published in October 1938, followed by detailed plans later that year. In May 1939, the RLM ordered a batch of six prototypes. The first Ar 240 V1 prototype, DD+QL, took to the air on 25 June 1940, and immediately proved to have poor handling in all axes, and it also tended to overheat during taxiing. The handling was thought to be the result of the ailerons being too small given the thick wing, so the second prototype was modified to have larger ones, as well as additional vertical fin area on the dive brakes to reduce yaw. In addition small radiators were added to the gear legs to improve cooling at low speeds, when the gear would normally be opened. Ar 240 V2, KK+CD, first flew on 6 April 1941, and spent most of its life at the factory in an experimental role. Ar 240 V3 followed, the first to be equipped with the FA 9 rear-firing armament system, developed jointly by Arado and DVL, armed with a 7.92 mm (.312 in) MG 81Z machine gun. Ar 240 V4 was the first to include an operational dive brake, and flew on 19 June 1941. Ar 240 V5 and V6 followed in December and January, including the upgraded FA 13 system using two 13 mm (.51 in) MG 131 machine guns in place of the MG 81Z for a considerable boost in firepower. The Ar 240's excellent straight line performance quickly led to the V3, V5 and V6 being stripped of their armament, including the defensive guns, and used as reconnaissance aircraft over England, where no other two-seater could venture by 1942. I saw this one on the 'dead kit' pile at the LHS, which is where kits that have been started or are incomplete go to be picked up by suckers enthusiasts who don't mind a bit of extra work or need parts. I had never heard of the brand and figured for $4.00 (and apparently complete), how bad could it be. When I got it home I opened the box and mentally kicked myself for not looking more closely. True, the kit had been started as the previous owner had glued the fuselage halves and wing halves. But I soon saw why it was never finished. 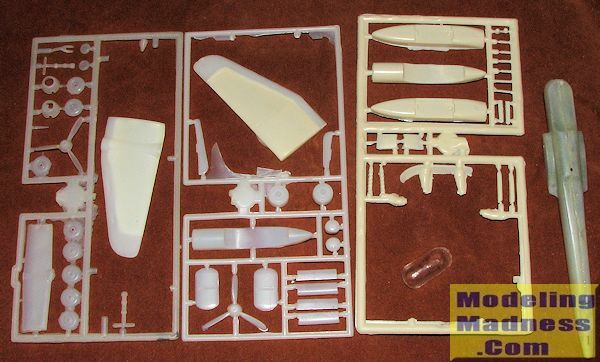 First off, the plastic is what one would expect of a VeeDay kit or early Merlin kit. Either cream or translucent white plastic with lots of sink marks and a ton of flash. There is no cockpit. On the wings, the lower wings are very much thinner than the upper, with the result that there is about a 1/16 inch step all around the inside where the lower wing fits. I'd venture to say at least 2/3rds of a tube of Tamiya filler would fix that. There are also sink areas in the thicker plastic that you could float a 1/350 PT boat in. I was surprised to see that there are actually wheel wells molded into the underside of the nacelles. The four main wheels are in halves as is the tail wheel or those would also be a big sink mark as well. There are slots in both the wings and the wing roots, which I though rather odd. It should be that one part has the slot and the other the tab. A minor oversight, I'm sure. Horizontal stab and the fins are separate pieces and thankfully, relatively free of sink areas, though there are thick mold seams, a situation that is typical of all the parts that are not heavily flashed. You do have separate gun barrels for the turrets, but one would find it easier to simply stretch sprue that to try to do something with the overly large and flashy barrels included. A thick canopy is included and my kit was missing the lower nose transparency. Instructions are six steps and nicely drawn. Markings are for two planes that differ only in radio call signs. They are to be painted in RLM 70 and 83 (apparently this is the blue RLM 83 that was briefly used mid-war) on the upper surfaces and RLM 76 undersides with yellow fuselage band and lower wing tips. 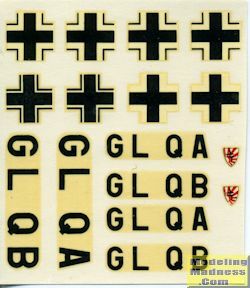 The decal sheet is quite yellowed and may not even be usable. Interestingly, there are swastikas on a small additional sheet that is not shown. If you see this on, walk quickly past. I am not sure it is worth the effort to even build as a stand model, thanks to the major disparity between the upper and lower wings. I guess one could sand the crap out of the wing to remove the step, but one would still have to deal with the sink marks. Revell released an Ar-240 back a decade or so ago and I still see them from time to time. Not sure how that one is, but it has to be a TON better than this one. I'll probably end up binning this kit as all it will ever do is take up shelf space. Not recommended. Thanks to me for warning you about this one.